Perfect for both beginners and seasoned pastry chefs. Smooth action easily rolls out pie crusts, dough for bread, biscuits, pastries, pasta, pizza, fondant, cookies, crafting clay, and more. Freeze the rolling pin to keep the dough cool, or alternatively warm it up in water. Winter Children Girl Kids Baby Warm Wool Hats Beret Artist Beanie Hat Ski Cap 8C. Cozy Soft Strawberry Pet Dog Cat Bed House Kennel Doggy Cushion Basket Beds 8C. New 3D Bear Shape Silicone Fondant Cake Mould Cookie Decor Mold Baking Tools C.
Embossed design, it can be used to bake DIY bread, biscuits, COOKIEs, carved souvenirs etc.. - Delicate Christmas wooden rolling pin,with engraved skull pattern. 1 Piece Wooden Rolling Pin. Due to the light and screen setting difference, the item's color may be slightly different from the pictures. Slight differences in the colour tone of the website's photo and the actual item. hope you can understanding, will be sincerely appreciated. Rate (item arrived). Canada Rate (item arrived) 0.0% 47.1% 31.4% 17.6% 3.9%. Item Number :996284. United Kingdom. United States. 10pcs Zoo Farm Animal Plush Hand Puppets Finger Soft Toy To Baby Children Kids Z. Kindly Tip Size :23.5 5.3cm/9.25in 2.09in. 1XCute Bunny Soft Plush Toys Rabbit Stuffed Animal Baby Kids Gift Animals Doll Z. Size: 30cmx4cm(12" 1.5"). I'm responsible for goods and will to solve any problem for you. Great baking tools for cookies,dough,biscuit,cake,bread and pastries etc. - Exquisite and unique wooden rolling pin. 1 Piece Wooden Rolling Pin. Good quality! Excellent Service! Cat Print embossed wooden rolling pin. New, never used. Lots of cats to embed into your pastry! Great helper for croissant making,bread or pastry baking,etc. Lay out dough and roll to create the perfect croissant shape. Roller:17 × 6.5cm. Food grade ABS material,safe,eco-friendly and durable. Secure and sturdy wooden handles ensure you'll be able to apply maximum pressure. Non-stick surface makes rolling dough and clean up easy. 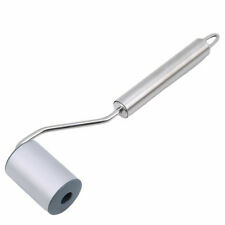 Revolving silicone roller and comfortable wooden handles with good quality toughness. Material:Wood Stainless Steel. hope you can understanding, will be sincerely appreciated. Rate (item arrived). Canada Rate (item arrived) 0.0% 47.1% 31.4% 17.6% 3.9%. Baking with embossing rolling pin can be a fun, especially for kids. The best patterns and created the best design for the rolling pin to get well embossed and beautiful cookies. 1X Christmas Rolling Pin. 23cm of Long. White colour. Food grade stainless steel, safe and healthy, durable, rust-proof, smooth surface, delicate, non-stick. Material: stainless steel of best quality. Docking prevents air bubbles from forming and allows dough to rise evenly and consistently. Simply press spikes into the dough and roll across the surface once on both sides before baking. Dishwasher safe. 1 x Croissants Rolling Cutter. The cutting is smooth, the cutting shape is good, easy to clean, and the necessary kitchen supplies for the croissant. Non-stick technology. There might be a bit color distortions due to different computer resolutions.